1907 witnessed the birth of a legend when carpenter Abel Rossignol, a very committed skier, made his first skis out of solid wood. In 1937, Emile Allais became world champion whilst wearing Rossignol skis; the rest, as they say, is history. Today, Rossignol skiing is a leader in alpine, snowboard, and Nordic equipment, as well as related outerwear and accessories, based out of France. 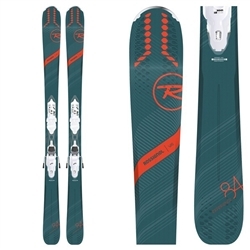 Browse our entire selection of Rossingol race skis, and skis for women and men, below!